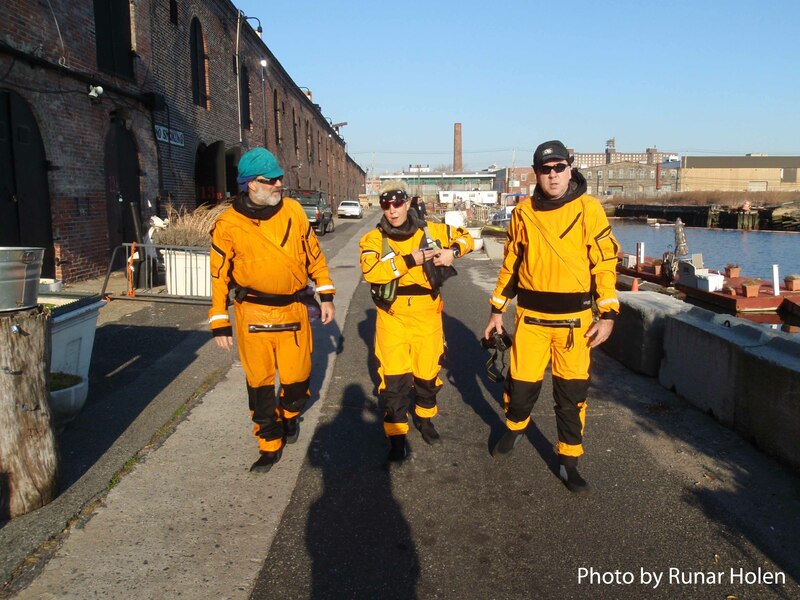 Here’s how it happened: We started late, and were plagued with boat difficulties, including maladjusted footpegs and backband, which forced us to land at Brooklyn’s Valentino Pier. But back on the water, the difficulties persisted. We were already two hours into the trip, and it was apparent that we would not make it to Swinburne Island before dark. What to do? Harry said that he knew of a landing spot just around the large, crumbling brick building ahead that extended into the water. 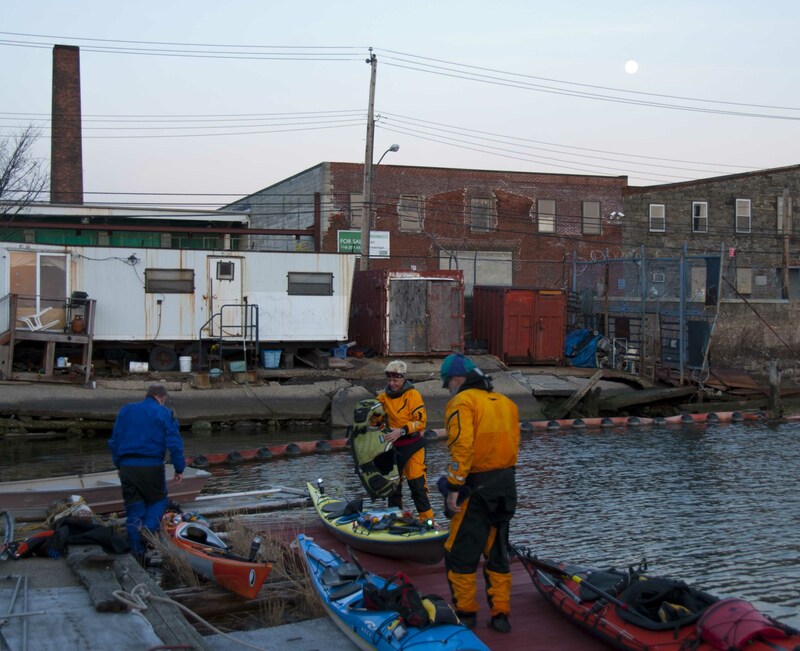 That turned out to be the Fairway grocery in Red Hook, beyond which a narrow shipping channel led into the Erie Basin. Once inside the basin, we were rewarded with a beautiful sight: The mother-lode of yellow Water Taxis! There they were, lined up at a dock, sparkling in the late-afternoon sun, along with one lone Shark. ... and he's wanted to do THAT for the longest time! After the obligatory photo shoot, we paddled down to the far corner of the basin, where Harry’s landing spot was. 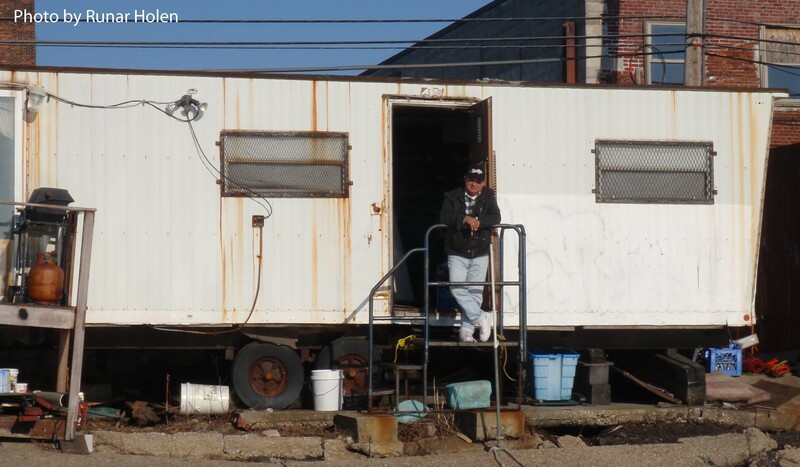 We were greeted by a fellow lounging on the porch of his trailer home, who informed us we were on private property. But after a nice conversation with Harry and Runar, he agreed to allow us to land and even agreed to watch the boats: “Just for an hour,” he cautioned us sternly. Delighted with this turn of events, we planned to have a nice meal in the first little cafe we came to and then return home. Little did we know the adventure was only just beginning! First up: The vintage car. After we disembarked, we had just started to look around when a cream-colored convertible drove slowly up to us. 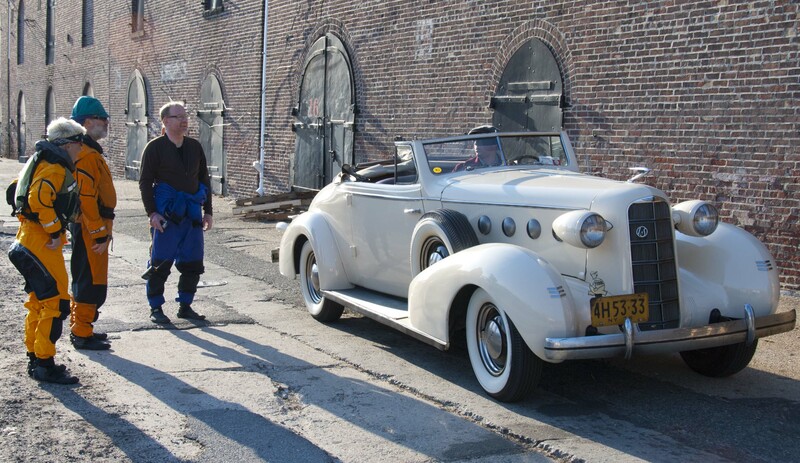 It turned out to be a vintage Cadillac, circa 1938: “A Great Gatsby car!” Runar exclaimed. Not quite. The driver (who graciously agreed to pose for photos) explained in detail the differences between 1920s (Gatsby-era) and 1930s car models, which are quite extensive (though we won’t bore you with them here). What a difference a decade makes! We’re so used to thinking that rapid technology changes are unique to this century—yet things moved just as quickly at the dawn of the last. A few other folks gathered to take photos of the car—and, a bit to our surprise, of us. 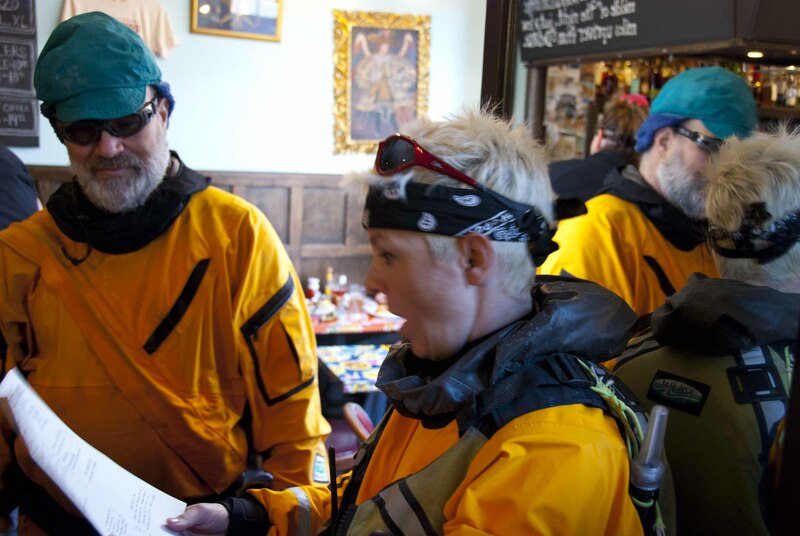 In retrospect, we should have expected it: Our ‘space alien’ bright yellow (or, in Runar’s case, blue) drysuits, and the impact they had on various people we met, became the ongoing theme of this particular adventure. 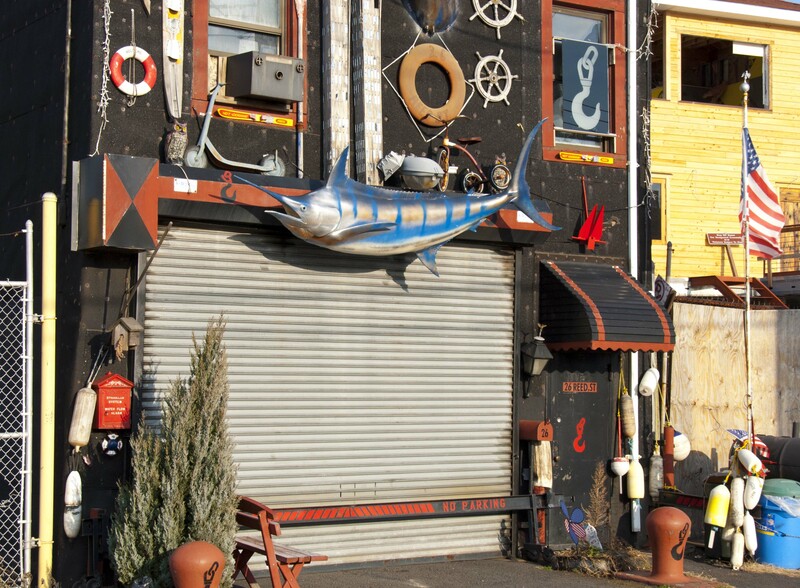 Red Hook is in Brooklyn, aka ‘hipster central’ of New York City. Brooklynites take their coolness seriously, and it can be a bit overwhelming and in-your-face at times. But perhaps due to its relative isolation (no subway lines), Red Hook seems to foster a less-aggressive form of hipster cool. People walked more slowly, were friendlier, and gawked more openly at the funny-looking strangers in their midst. That said, all the ‘cool’ cultural signifiers were still present. It was getting late, and we were hungry. 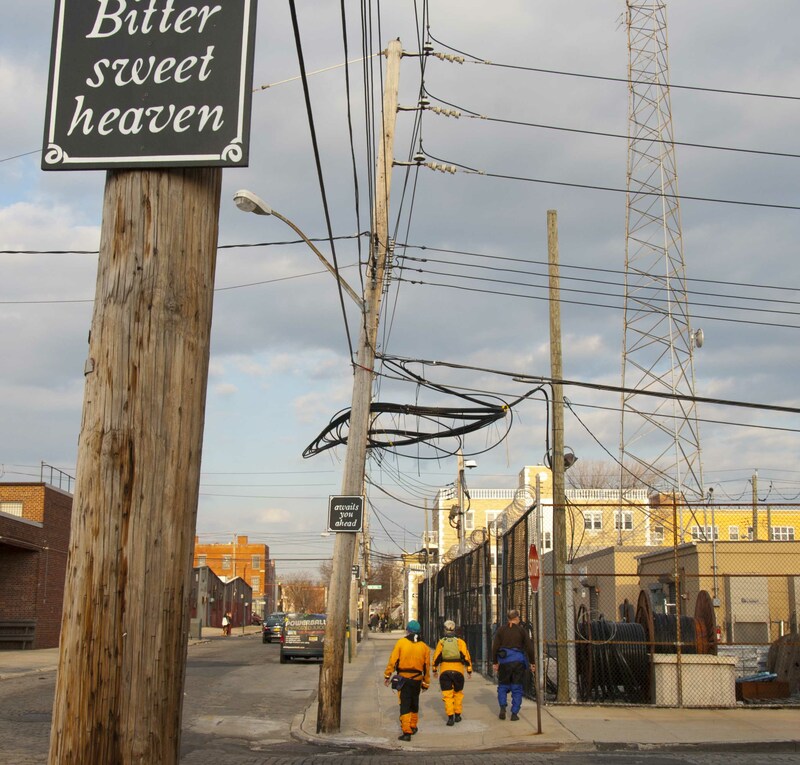 So, we headed down the streets of Red Hook to locate refreshment—in what turned out to be the most memorable part of the trip. At the first cafe we tried, the host (a young man tastefully attired in retro-looking plaid) greeted us effusively: “Oh, I love your outfits!” But he warned us there wasn’t much on the menu between lunch and dinner. Correct: Oysters, a few wraps, and cocktails. THIS is what they eat on this planet? 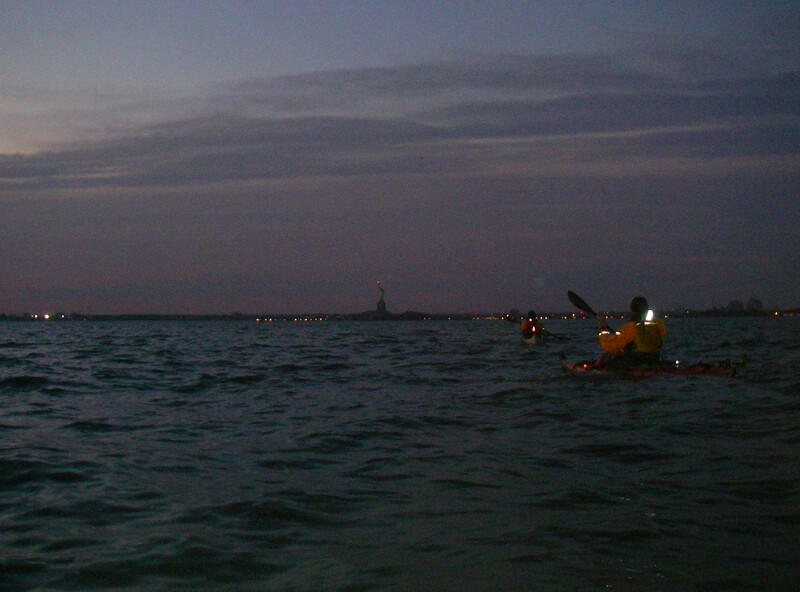 In other circumstances, oysters and cocktails would have been just the ticket—but remembering that we still had an hour or two of paddling home through frigid water ahead of us, we regretfully moved on. The next place we found—the ‘Hope and Anchor’—turned out to be perfect. And perfectly, unexpectedly entertaining. There was a warm buzz of conversation when we opened the door. 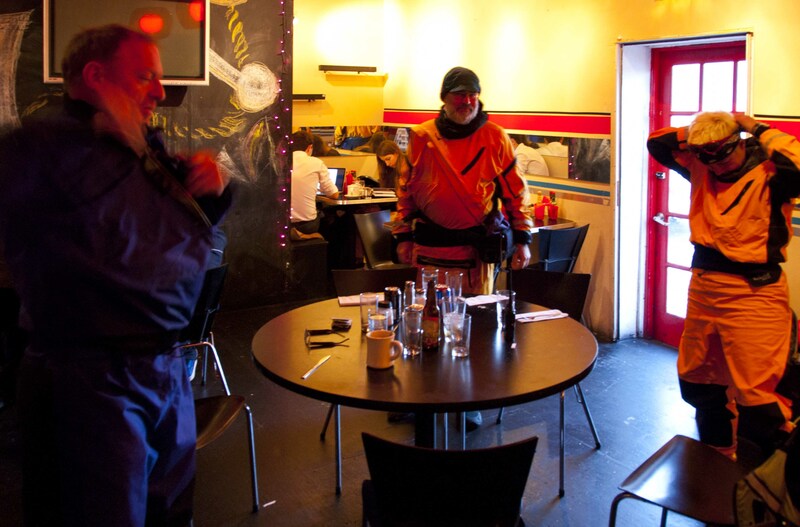 As we stepped through, wearing our brightly-colored drysuits, it cut off abruptly. Faces swiveled towards us. Forks stopped moving half-way to mouths. It was the comic-movie version of surprise—except it was happening in real life. “Because we have to get back in our boats to go home,” Johna replied. She nodded, apparently satisfied, and that broke the spell. The chatter swelled up again, and a hostess bustled over to lead us to the back room. Presumably it was the one reserved for visiting space aliens, because except for one other table, it was unoccupied. 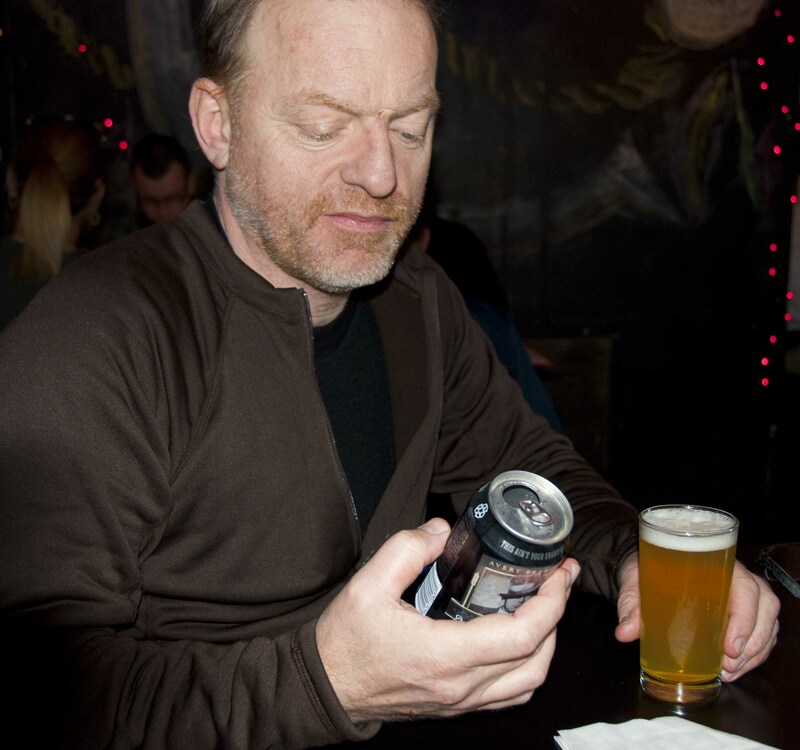 ... and this is what they drink here? 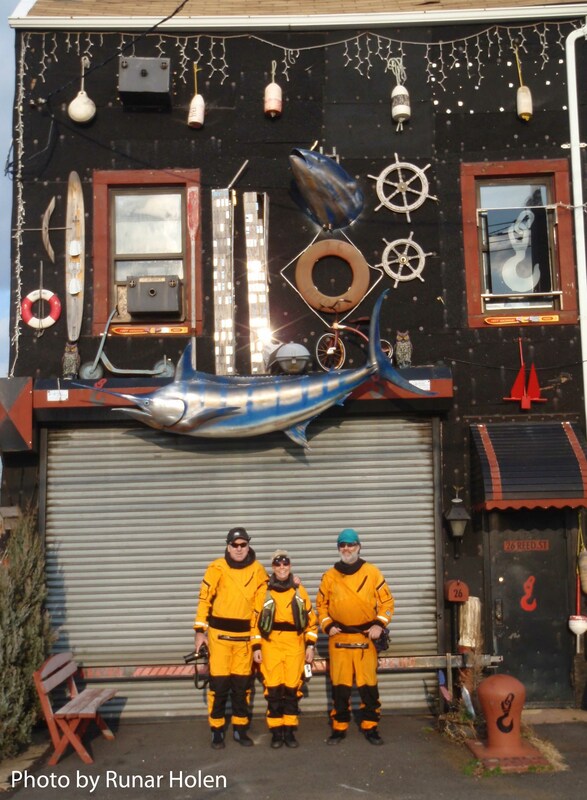 We unzipped and peeled down the top halves of our drysuits (if you haven’t seen this, the effect is something like a half-peeled banana) and settled down for some food and kayak-appropriate libations. Our server was another Red Hook hipster, friendly and amiable, and dressed in what we’d begun to figure out was the standard retro-plaid look. All went well until the end of the meal, after we’d paid and were getting ready to leave. We were all anticipating the usual next steps: A brisk offer to make the coffee, and perhaps Runar’s entire meal, complementary. Taken aback, Runar replied, “Well, yes, a little bit.” (Scandinavians are not big on admitting emotional vulnerability, but Runar isn’t exactly your typical Scandinavian). Long pause. No offer of remuneration. He gestured to a $20 bill lying on the table in front of Runar. (We had already left a healthy tip). And he sauntered off, while we collapsed in astonished laughter. That was pretty much the high point of the day, but there were a few more experiences to savor. A Sailor Jerry tattoo was characterized by bold unwavering lines with a refined use of color and amazing detail (the riggings in his clipper ship tattoos were nautically accurate). His one-of-a-kind work combined American design and traditions with Asiatic color and sensibilities. His visionary style is revered to this day. Then there was our re-entry into the main part of the restaurant. Once again, our space-alien outfits brought about a total stop in conversation. You could hear a pin drop as we made our way past late-afternoon brunchers to the door. Back at the dock, the trailer-house guy made no complaints about having watched our boats, even though considerably more than the promised hour had passed. We slipped him a couple of bucks to thank him, and set off into a spectacular sunset with a nearly full moon above. So that’s the story of how our trip to visit the seals turned into an excursion to experience a different sort of fauna entirely. The unexpected is the essence of adventure! And no, that does not make us sad. Not even a little bit! Photos by Runar (thanks, Runar! ), Johna, and, where uncredited, Vlad. More of Runar’s photos are here, more of Vlad’s and Johna’s here. 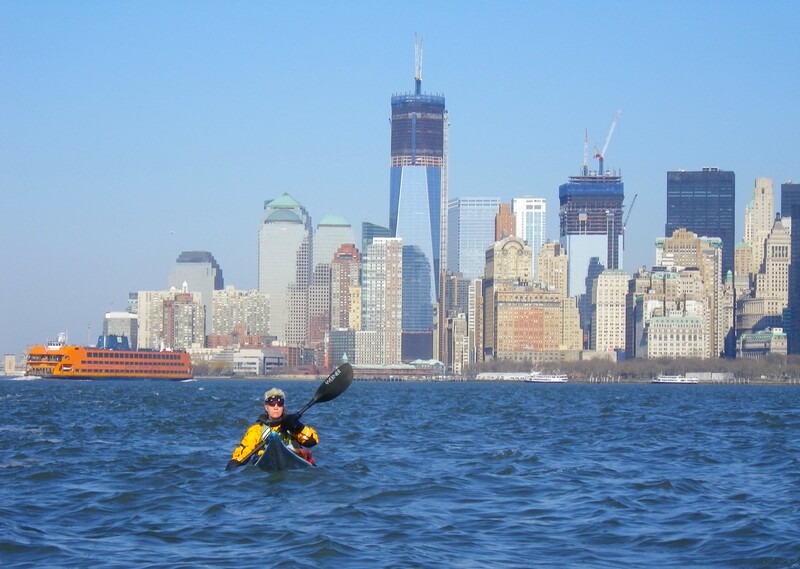 This entry was posted in Kayaking, New York City, Society and tagged Brooklyn, Drysuit, Kayaking, New York City, New York Harbor, Photography, Red Hook, Street Art. Bookmark the permalink. Wow…that doesn’t even look like Brooklyn! I must admit, at the end, I was totally distracted by your awesome haircut. Great post! Best bargain in the city–it’s around $20 in Salon G in the Village, ask for “Italian Cathy”..
LOVE the space alien references … so funny! Looks like a beautiful outing with incredible weather. And a fun story to go along with it — thank you for sharing. OMG!! OMG!! I know how lame it is to use those 3 initials, but OMG! What a perfectly PERFECT day! How serendipitously LUCKY are you! Hurray for FP! 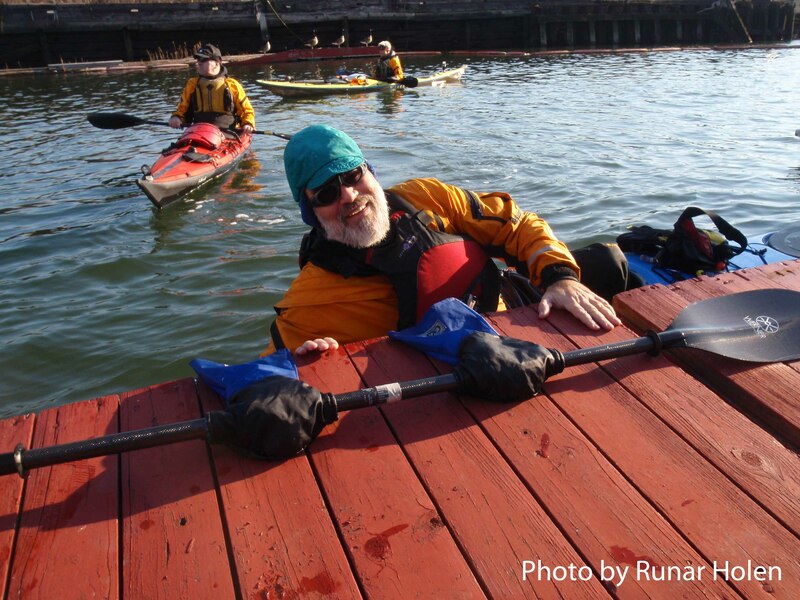 Great post, thanks for sharing the account of your paddle and landing expedition! 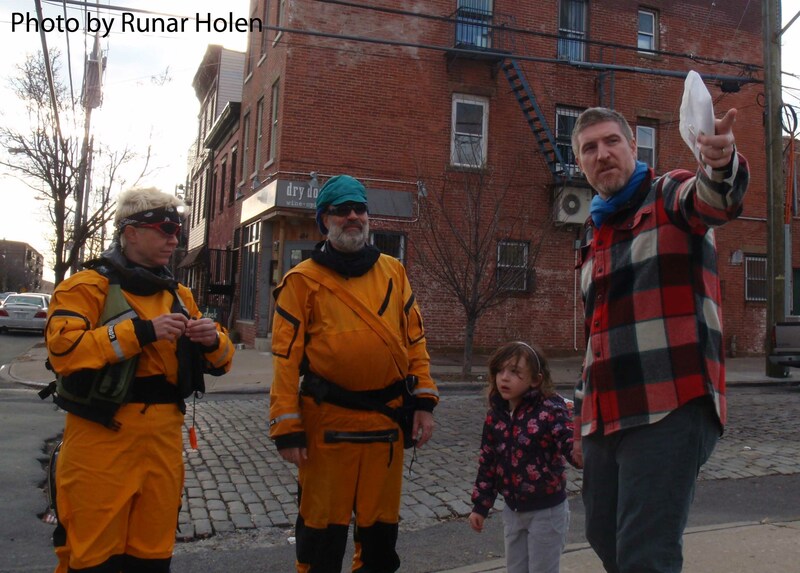 Red Hook seems to invite adventure – I trekked there from the closest subway stop last February in the midst of the great snow and had a fine time. You should head back for the Key Lime pie sometime. Noel– Your photos are fantastic! I got a chuckle out of the bike buried to its handlebars in snow. And black-and-white gives a totally different impression–emphasizes the old-worldliness, somehow. One your story makes me want to visit Red Hook on my next trip to NYC just to see the Sailor Jerry wall paper. Two the server’s “Does that make you sad?” response is priceless. I have been a server on and off for years and I couldn’t imagine saying that to a customer. Oh the lifeforms on planet Red Hook. Thank you for sharing such an amazing adventure. Thanks, Bold Wandering! We probably should have noted that the food was quite tasty–since you’re a foodie, you’d probably want to know :-). And yes, “Does that make you sad?” was really the inspiration for the entire post. I literally put my face in my hands and started laughing when he said that. Thanks for reading, and do visit Red Hook! Great title – I wish I was called “Red Hook”! Awesome pics – love the cat! Fantastic post – magnificent adventure. I’m a born and raised Brooklynite, and Redhook is an up and coming neighborhood. 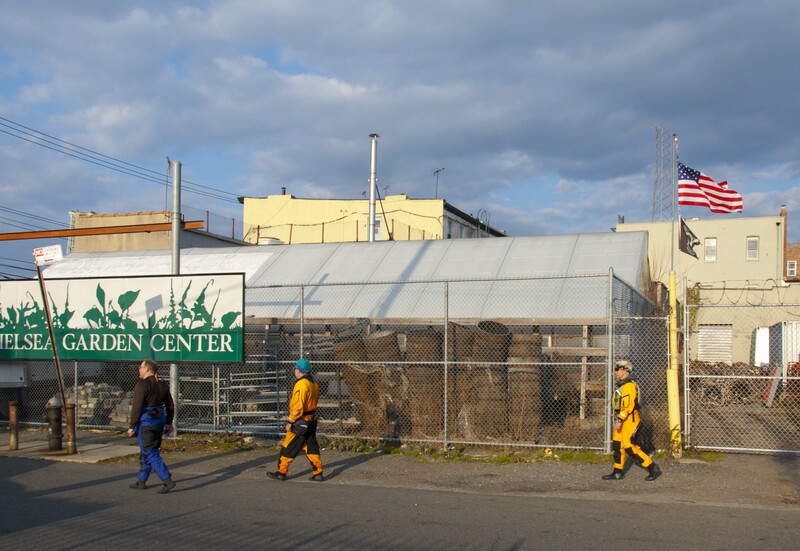 Used to be that Redhook was a place where you didn’t dare to venture; but now, it’s the place to explore. Nice post. Yeah, that’s about all I knew about Red Hook (“stay away!”) We were SO pleasantly surprised to discover it. As a Brooklynite we sure do take our coolness to the extreme. But Im not that cool to be a hipster. I guess this should make me sad….. or happily not… Great post btw! 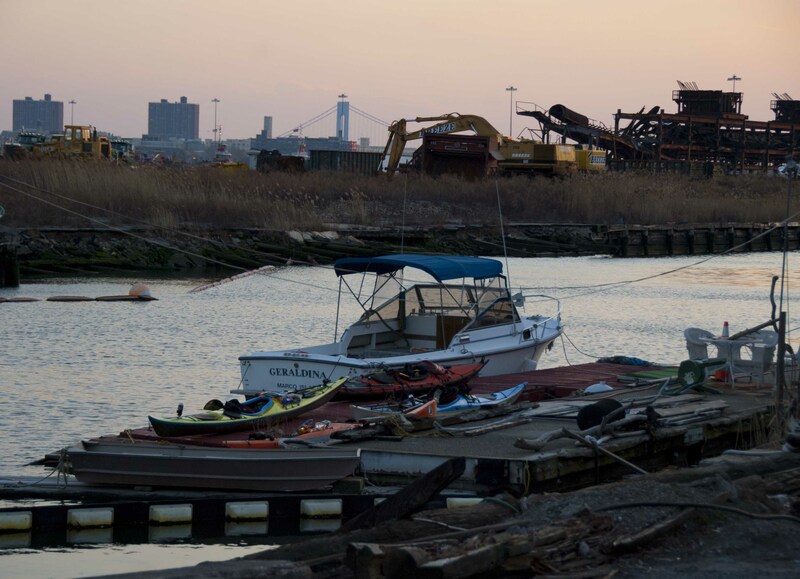 ive always wanted to go kayaking in the dirty waters of the Hudson and East River and in the Gowanus area. One of these days… hopefully. Way cool! I am going up for my BCU 3* this summer (second try). Last year we did a NYC Storm Gathering and had some UK coaches come over–it was a blast! 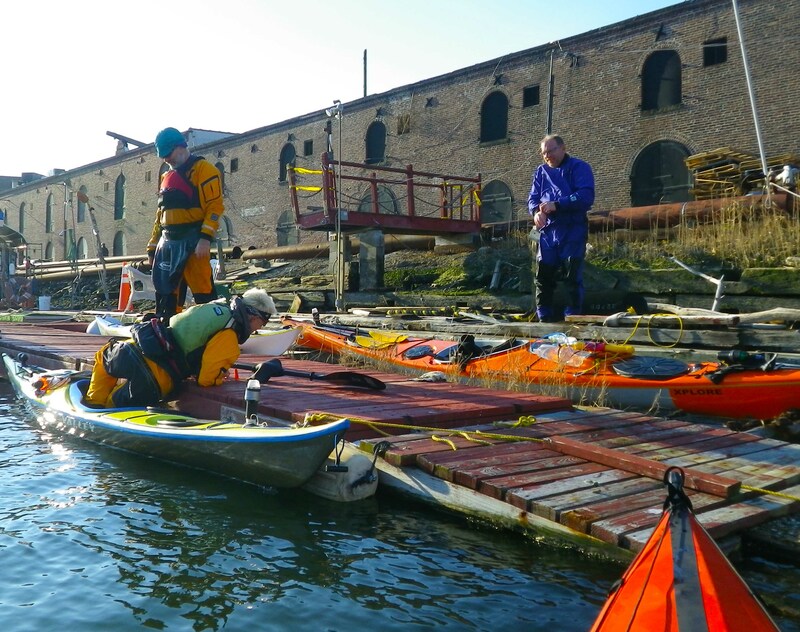 New York Kayak Company hosted. Hope it happens again this year, and if so that you can make it! 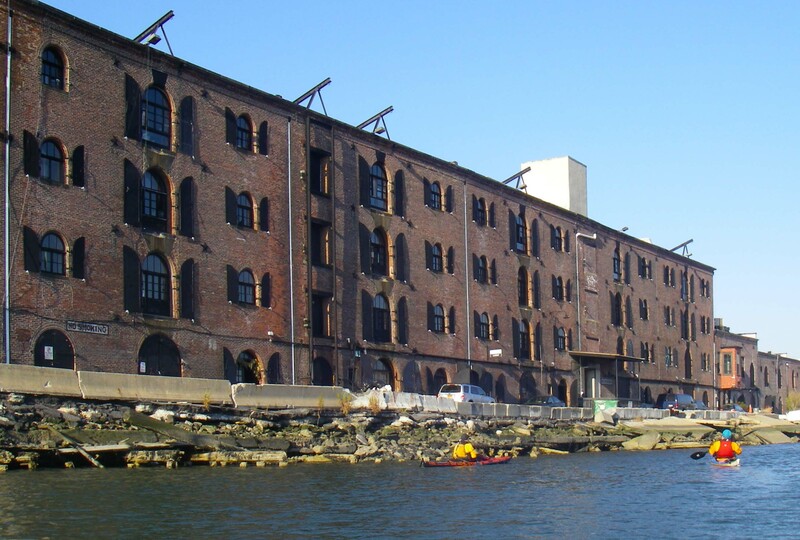 I absolutely loved this post as I’m fascinated by Brooklyn and Red Hook in particular. I visited the area with my kids in April 2011 when researching my novel (in which it features) and even wrote a little blogpost about it a few months back, if you’re interested. I recognised many of the views and buildings from your photos (we weren’t so lucky with the weather) and like you, I have memories of that day I’ll never forget. Did you see the parking lots with hundreds of yellow school buses? 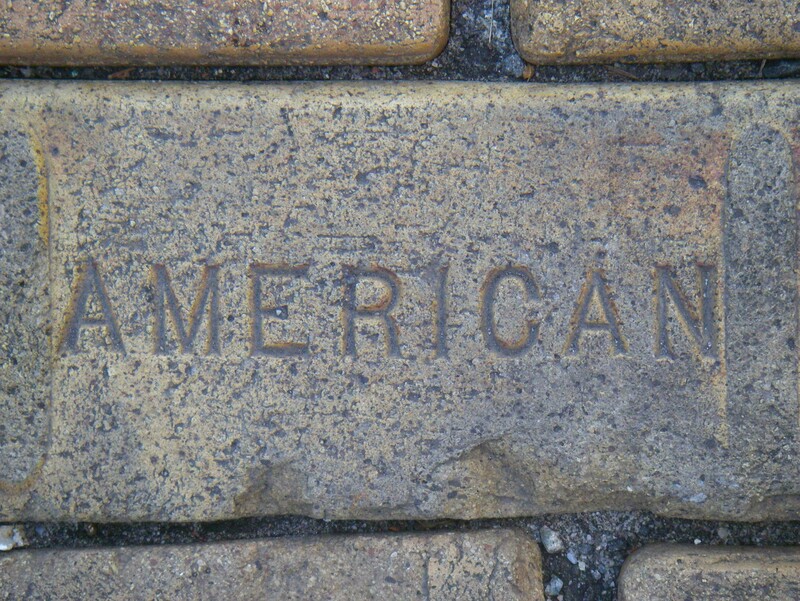 A moment of classic Americana for us Brits. Maybe we’ll bump into you on our next visit there. Your story really made me smile! Thanks! And yes, do post a link to your blogpost! We didn’t see the yellow school buses, but then there was so much we missed. We didn’t expect the trip to turn into such a journey of cultural exploration—we set out to see some seals! But now that Red Hook is on our map, of course we’ll do some research and go back. Congratulations on Freshly Pressed! You both deserve it, I hope it brings others to your wonderful blog! Sounds like a very fun adventure, but isn’t it cold now for kayaking? Too cold? No! We go all year. But it is different in winter than in the summer. You’ve got to be a lot more prepared and take many more precautions against getting cold—never mind falling into the water, which could be life-threatening. 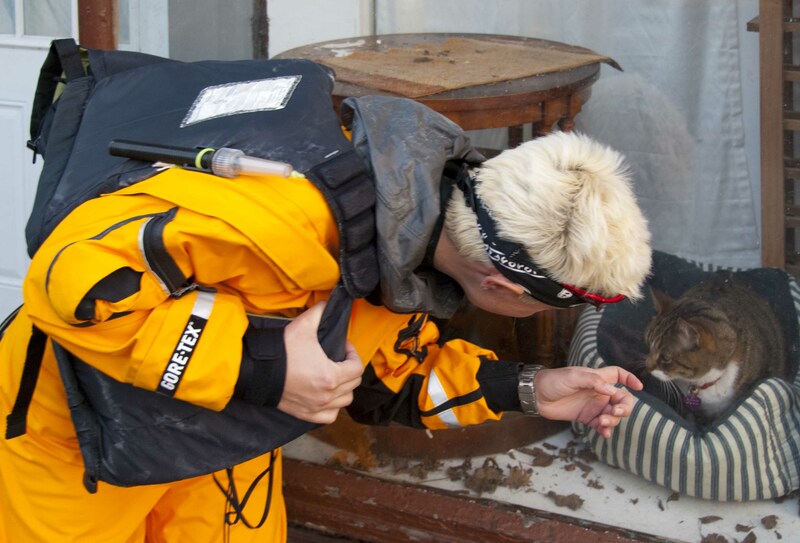 Hence the drysuits. Loved this post. We tried to land on Swinburne Island last summer, and couldn’t land. 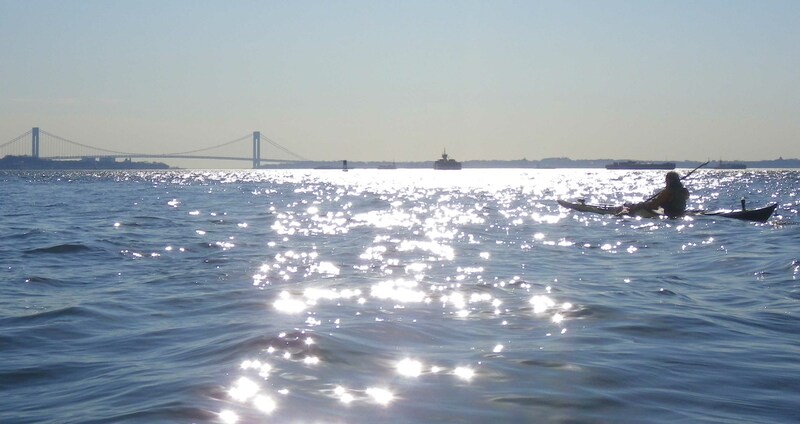 That’s when we turned back to Staten Island, and I had my encounter with the rip tide. Is that Harry Spitz from DTBH or another Harry? Very jealous. Want to do Red Hook this year. Swinburne Island: At least a few years ago, it was possible to land if you knew that at the back of that miniature cove there is a beach, albeit tiny and covered at high tide. So you don’t have to land directly on the rocks. But then you do have to drag your boat up the rocks so as not to lose it to the waves. Yes! Looking forward to that, too. 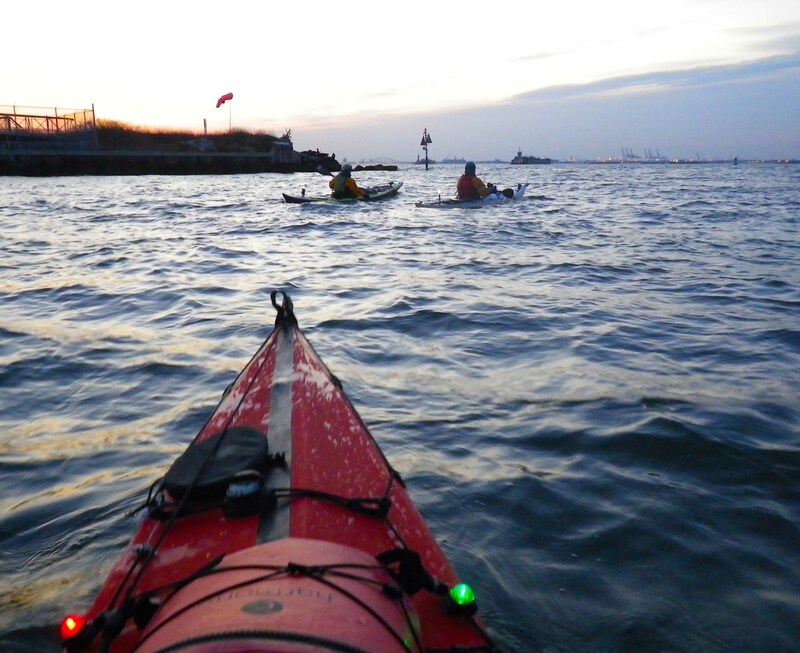 Insightful post… I never kayaked before however your blog makes me want to take lessons thanks! I’m not a kayaker but it looks like fun. The pics are amazinf. How serendipitous! Who knew that missing out on the seals would result in such an amazing adventure? Thanks for sharing! great post. the photographs are really good and you got a funny adventure. Ciao amici, love the blog, what a trip! Space suits on the go……loved reading it. It’s always good to see parts of America other than the sanitized versions from tv, but you won’t get me in a kyak no way! Great pics too. I’m in Florida and I love exploring (mostly tiki bars and fish camps) but reading your blog was a great morning experience. Well done! Brooklyn is and always will be my heart and my home. Its good to see that some people are still out looking for those little peaces of it that just bring out its best. My Dad grew up in Red Hook circa 1930’s. He always described it as the “tough side of Broolklyn”, but I don’t think he would have wanted to grow up anywhere else. Seeing it this way really makes me want to visit (the building that was his home still stands) Thanks so much for this journey! You can! 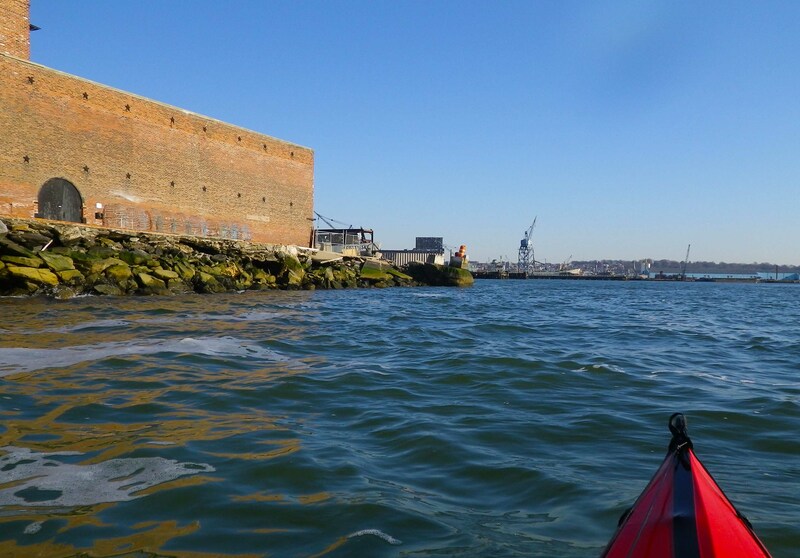 When the weather gets warm (usually in late May) the Downtown Boathouse begins offering FREE kayaking at Pier 40 on weekends. You get the feel of what it’s like to be on the water, without any risk (the boats are sit-on-tops and virtually un-capsizeable). 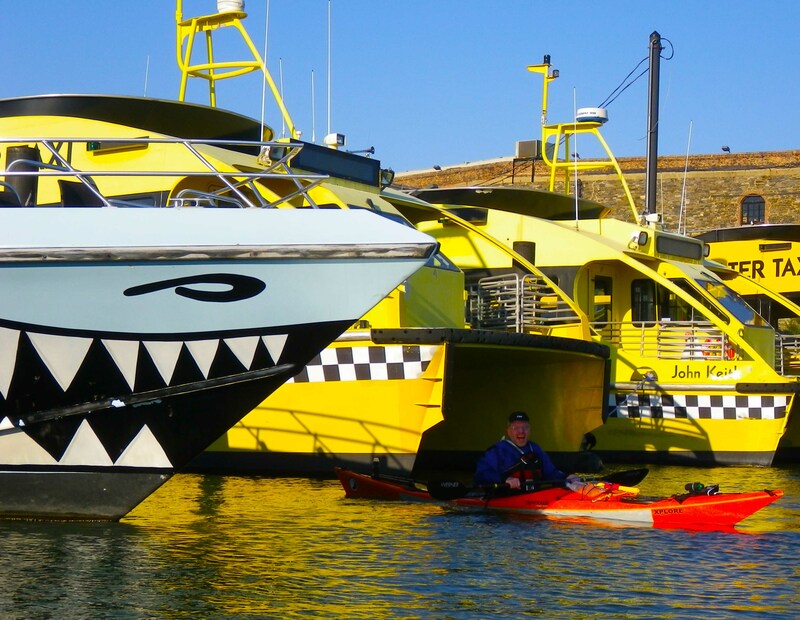 Well, there is ONE risk–you could get hooked on paddling, and end up buying your own boat and having adventures. 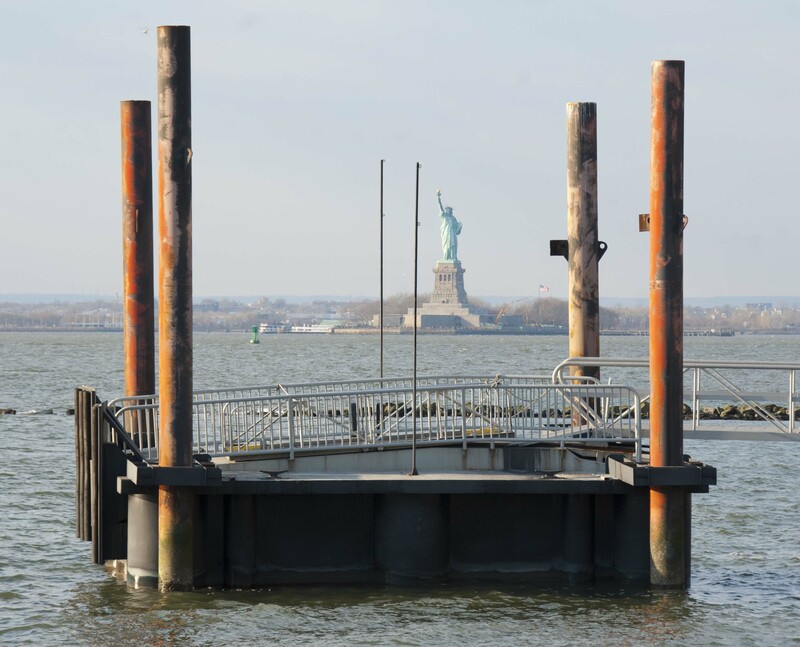 Not just at Pier 40, but also at several other locations along the West side of Manhattan, including one just south of the 79th Street Boat Basin—perhaps a little more convenient for the Upper West Side. Ha Ha Ha! Someday when I grow up I hope I’m cool enough to be a hipster. I’m glad you weren’t sad and I can’t imagine the hilarity of the exchange! to think how many times I drove past Red Hook from Staten Island into Manhattan on the BQE and never stopped here. thanks for the adventure. Wonderful story Vladimir, and I must say, you are the first real person I’ve met named Vladimir. I think often the best adventures are the unplanned ones. And you’re very brave to be kayaking in such little boats in such big water. Glad to see you were Freshly Pressed. Now that I think about it, I don’t know any other Vladimirs either—although the world is full of them, mostly in Russia. Sometimes the best way to get found is to just get lost. I thoroughly enjoyed reading your adventure. And congrats on making freshly pressed! Thanks! We’re floored, actually. It’s amazing how many people have checked in–thanks to you all for reading, and posting! One if the best Brooklyn adventure posts I’ve read! Love the photos as well (I am a camera lover — which one did you use?) I will not kayak to Red Hook but using landlubber’s transport will get there as soon as I can. Haven’t been to Red Hook for 30 years or so — I guess I’ll be amazed? Hipsters are different from hippies are different from Beats are different from (what came before, anarchists?). Brooklyn’s cool crept up on us former Brooklynites — when we lived there in the 1980’s Brooklyn was mostly the step child of Manhattan — (Queens was a suburb) now it rivals Manhattan and might have recently past it in terms of cool…..
Cameras: these photos were taken with four different cameras. For kayaking, where everything gets wet sooner or later, I use a waterproof camera, these days a Pentax Optio W90, and Johna used an older model of the same camera, the Optio W30, I believe. But for the photos on land I used a DSLR, a Nikon D80. Finally, Runar used some other kind of small waterproof camera—every manufacturer has one of those these days. thanks Vladimir — the Pentax seems popular — keeps popping up and its perfect for your situation. So all the photos look great — its not the camera — its the photographer and light that make the photo. I know of a brilliant professional photographer — Darwin Wiggett http://www.darwinwiggett.com/ who uses all sorts of cameras and says “I get the same result no matter what camera I use.” Still I find knowing “which camera” fun and continuously interesting — so — Thanks again! Frank—thanks for alerting me to Darwin Wiggett’s site! Lots there to admire and learn from! Reblogged this on Cre8tive YouTH*ink. Very nice. I had heard of this neighborhood strictly in terms of its waterfront aspect and now know that it is more. 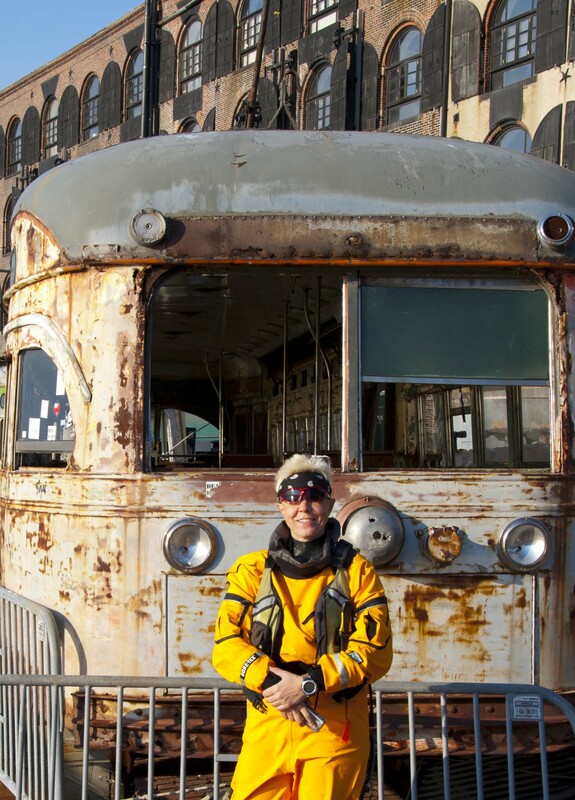 A cousin of mine and his friend have been to that abandoned grain elevator behind the streetcar for an urban archaeology photo shoot before that I’ve seen the results of, redoubling my desire to get there some day. However, it’s not exactly convenient to Indiana so I’ll have to bide my time. PS, I do my kayaking in an antique fiberglass Danish Struer on Lake Michigan in Michigan’s Harbor Country. If I was able to do it in NYC it would be quite the change of scenery. Oh, do come! Indiana is not THAT far from NYC (I know for a positive fact that there are airports there). And urban kayaking is not to be missed—though I wouldn’t mind experiencing Lake Michigan, myself. Freshwater paddling is still quite the novelty for me…. (I think Vlad has done more)…Anyway, do try to come out. It’s worth it! 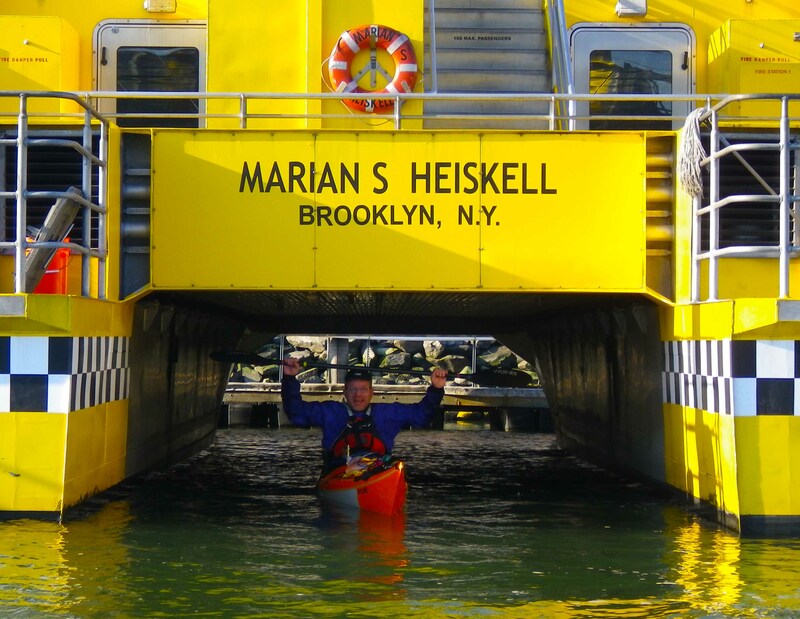 I’ve done a little urban kayaking, and reading about your adventures whets my appetite a whole lot! Thanks for sharing and posting, and congrats on making freshly pressed!. 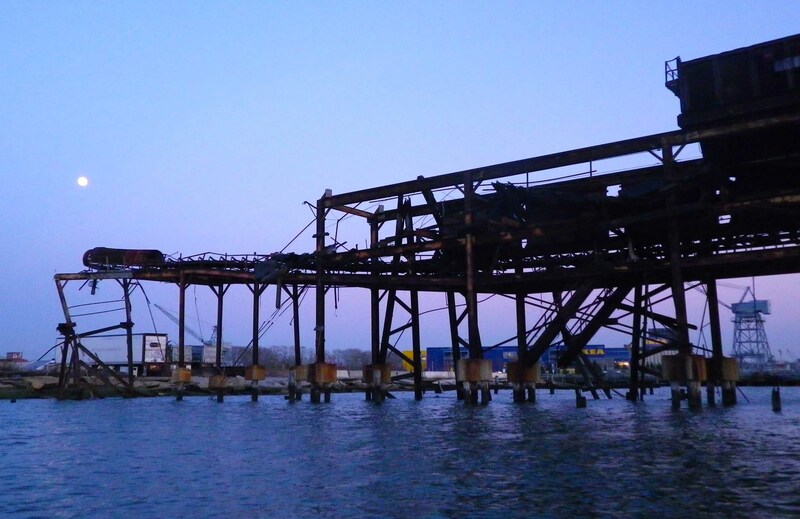 Thanks for the update and photos of Red Hook. I lived there back in the early 90s before it gentrified with the trailer and all. It was pretty desolate then. Just me, the projects, and John’s bar. I imagine that’s all gone now because the artists have moved in. I loved it back then because it was so cut off by the Gowanus. I lived on Columbia Street. The loneliness was palpable. Years later I wrote a story called “Jump,” inspired by the building in your photo #8. “We land at the luxurious private dock.” The story was about jumping off that building. LOL: “Gentrified with the trailer and all”. :-) You are welcome, and thanks for posting! Photos, histories, and preservation and reuse plans of these and many other old Red Hooks buildings, as well as a brief history of Red Hook as a whole, are contained in A Preservation Plan for Red Hook, Brooklyn (link downloads pdf), a 2009 project of the Historic Preservation Program of the Graduate School of Architecture, Planning & Preservation at Columbia University. Worth taking a look! Adventure as a way of life huh? Why? Go back to your cubicle at once! What an entertaing account of your Red Hook journey. The pictures are amazing, and as a former New Yorker from Brooklyn (Flatbush) it made me feel homesick. I worked as a bank manager for a number of years in the Red Hook area–great people and wonderful neighborhood spirit! Thanks for sharing and congrats on being freshly pressed! Thank you! And thanks for reblogging…. Loved this blog post today! Hey T: It really was! Next time you need to come along… we had a blast! Very cool photos! Love the Great Gatsby car. I really miss paddling. I used to do a ton of it about ten years ago, but no longer have a kayak. One day I need to get a new one. Makes me want to pick up a kayak.